And sure enough, he selected what may be the most famous marine scene of all time—Katsushika Hokusai’s The Great Wave Off Kanagawa. 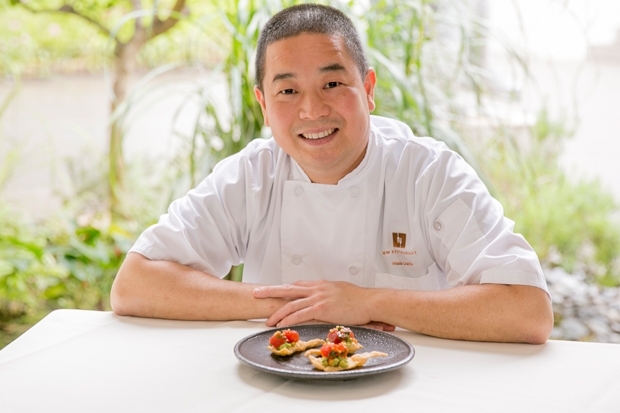 Along with Ueoka, Palette features chefs Kevin Lee of Pai Honolulu, Michelle Karr-Ueoka of MW Restaurant (and Wade’s wife), the Honolulu Museum of Art Café’s Robert Paik. They were invited to wander the museum or browse a selection of images of artworks and choose one on which to base a trio of dishes—two small bites and one full plated course. 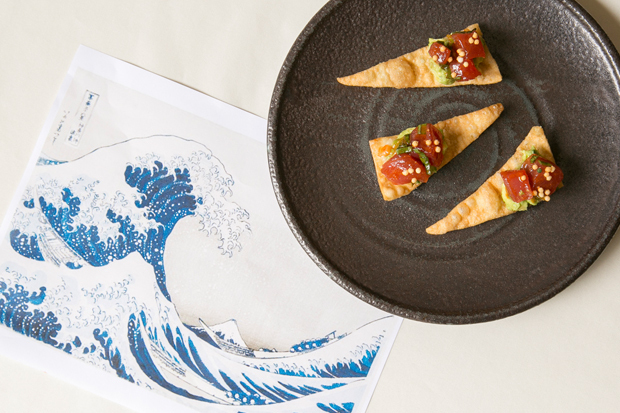 Wade Ueoka’s ‘Great Wave’-inspired ahi poke nachos. So what did Hokusai inspire Ueoka to create? His two bite-size dishes are a wonton chip topped with avocado salsa and glistening ahi poke, and a pa‘i ‘ai cake topped with kalua pig and lomi tomato (a whole lū‘au in one bite!). His big plate, which will be served to Gold and Platinum Tables, is steamed Kona kampachi and seafood dumplings in a lemongrass-chili broth. The event is an opportunity to get to know the museum’s collection better—curators will give mini-talks about the artworks that inspired the dinner. And gusts can see at no extra cost the exhibition everyone is sharing on social media—Abstruction: The Sculpture of Erick Swenson. Oh, and did we mention there’s an open bar featuring art-inspired cocktails? Taste the art! There are different ways to experience Palette—from a lively, mobile grazing session that allows guests to try 10 different bites from five chef stations, to a formal sit-down dinner with specially paired wines. See them all and purchase tickets online.